Roof terrace now has railings for extra safety. Just 15 minutes drive from Turkey’s buzzing holiday town of Bodrum (and the airport), Villa Quartz 14 is a haven to ‘drop and flop’ in the sun and in style, at the family friendly Turquoise Resort. This tasteful development runs down to the shores of Lake Tuzla, a nature reserve, and has everything parents really need both within the resort and at the villa itself. Plus the local Dolmus mini bus, stops by en-route to Bodrum centre. Villa Quartz 14’s bijou but beautiful private pool makes a tantalizing first impression, framed by vivid bougainvillea, set out with sun loungers and featuring a semi circle of Roman Steps where parents can cool down with baby, plus pool inflatables are provided. A pergola shades the dining terrace and the built-in stone barbecue is perfect for sizzling up spicy kofta kebabs or the local catch of the day. Besides the safely enclosed pool terrace, Quartz 14 has a fab walled roof terrace, scattered with giant lounger cushions for parents to catch some rays and enjoy sundowners looking over to Lake Tuzla, which is a haven for birds including pelicans and flamingos. 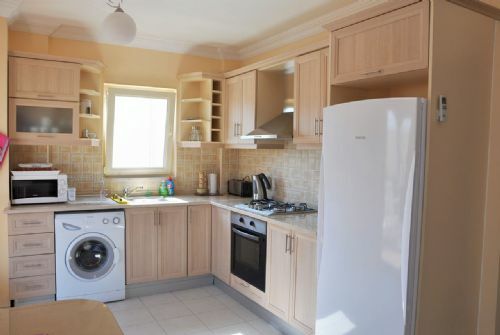 The ground floor of Villa Quartz 14 is a roomy, open plan arrangement, with funky finishing touches such as bright red sculptured stools at the breakfast bar, complemented by a Phil and Ted Lobster high chair, in red of course. The lounge area, which opens onto the outdoor terrace, has two leather couches for watching the flat screen satellite TV or DVD’s, and a selection of toys, games and books are provided. The kitchen is modern and especially well equipped for babies and toddlers, including a sterilizer and bottles, hand blender and feeding time Tupperware. Quartz 14 has two bedrooms on the first floor which tick all the boxes for families. 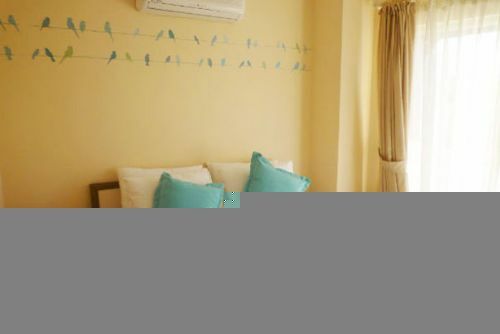 The master double bedroom has an ensuite wc/bath/shower room and its own private balcony, plus foam toppers on the bed for extra comfort and to help parents sleep as late as possible. 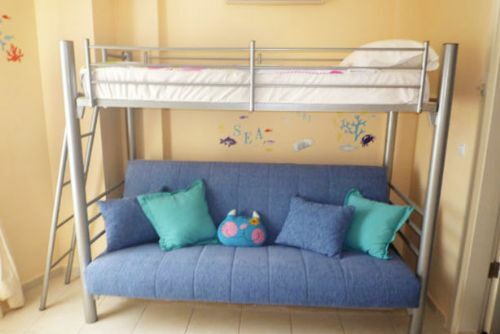 The second bedroom has a blackout blind and versatile bunk bed which can be set up as a sofa or double bed below, and a single bed above, plus a second WC and shower is ensuite. The owners can provide a new, multifunctional Deuba travel cot/play pen, top quality Kit for Kids Eucalyss foam mattress and a high tech Tomy digital monitor, featuring two-way talk and remote control lullabies! Opposite Villa Quartz 14, children can burn off some energy on a play area, with a climbing frame, slides and swings, then Turquoise Resort’s main swimming pool with waterslides is only a hop, skip and a splash away! 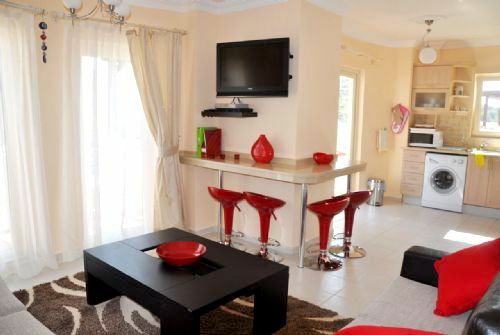 Villa Quartz 14 is ideal for a family of up to two adults, three children and one baby in a cot, plus there is a sofa bed in the living room for two more guests. 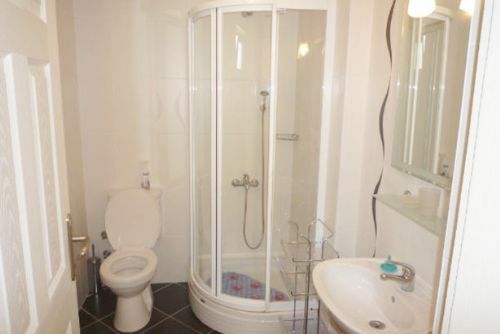 The master bedroom has an ensuite wc and bath with a shower. 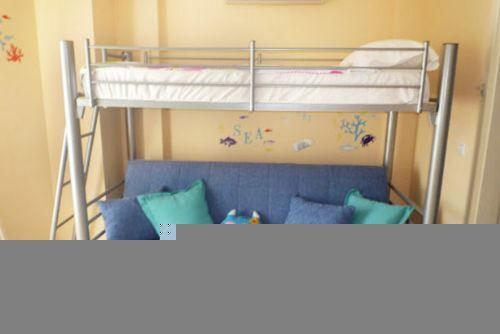 The second bedroom has an ensuite and a triple bunk bed which can be set up as a sofa or double bed below and single bed above. There is a downstairs WC. 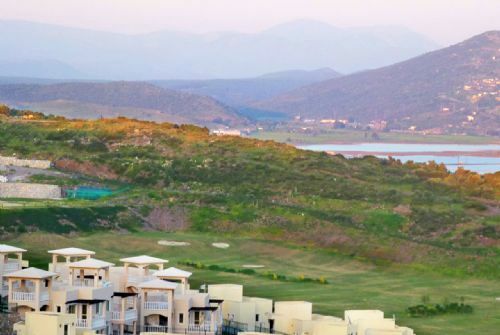 Villa Quartz 14 is at the heart of the Turquoise Resort on Lake Tuzla which is just a 15-minute taxi transfer from Bodrum airport and offering everything parents really need for a relaxing holiday in the sun. Besides the villa’s own small private pool, the resort has a choice of indoor and outdoor pools, including one very close by with waterslides. The Artev Beach Club is also a short walk away, or families can hop on a free shuttle bus to take advantage of the watersports, beachside restaurant and bar. Other leisure and pleasure pursuits onsite include beauty and fitness centres, a Turkish Bath, giant chess, mini golf and a 9-hole practice course. Five minutes walk from the Turquoise Resort, a mini shopping centre and well stocked supermarket provide most of the food and ‘stuff’ that families will need. There is also indoor and outdoor dining at the Turquoise Restaurant and the more informal Sunset Cafe. A local shuttle bus is available into Bodrum to see the historic sites, take a boat trip from the marina and choose from countless cafes, restaurants and takeaways to suit all tastes and budgets. Getting There: There are many flights from airports across the UK to Bodrum, which is only a 15-minute taxi transfer from Turquoise Resort. Nearest Medical Services: 24hr GP at Turquoise Resort which has a private ambulance into Bodrum in necessary. Please note: A complusory £5pp non-refundable damage bond to cover accidental damage up to the value £100 will be added. We purchased this property in 2009 and every year we go 2/3 times a year. Each year we try to add to the villa facilities to make it homely and add the little luxuries for all to enjoy. My husband and i have a 4 year old and a 2 year old. Our son and daughter travel twice a year to Turkey 3 times this year 2017 we are going for a long summer holiday. 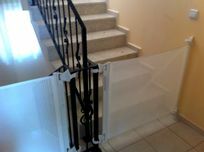 With our children in mind we have adapted the villa for extra safety and to minimise what you have to carry on the plane. Our policy is if we as owners would like to have something in the villa to make it more convenient for our use, we make sure it is available for our guests. The location of the villa is great. You are directly opposite the main pool, waterslides, mini market and restaurant/bar. So you really do not have to walk far to get food/drinks or villa supplies. I have travelled to various locations in Turkey and was surprised that Bodrum even in the peak season continuously has a cool breeze. Most people who live in Istanbul have holiday homes in the Bodrum peninsular due to the cool breeze. I would recommend if you are worried about young children and heat to go in March/April/May/or Sept/October. My family has just had 2 weeks in October and the weather was like our warm summers in the UK, just right for small babies. We now appreciate that holidays are no longer what they were pre baby, so when our son goes down for a nap we are relaxed to know that he is safe in his cot only 2 minutes away from us in his room. With the monitor on we get to sit by the pool, read, sunbath or have a swim. Could we do this in a hotel? Probably not, as one of us would have to go up to the hotel room. The roof terrace has had railings put all around the walls for extra safety if your older children want a place away from the parents to read and relax. There is a fridge/freezer on the top terrace to keep your drinks and snacks cool. For adults this is a perfect spot in the evening once everyone is in bed to retreat to and take in the views of the lake and the sun setting and enjoy a lovely bottle of Turkish wine. Our son loves the paddling pool we put out on the kitchen terrace as it is in the shade, so he can splash about for as long as he likes. As most children are very active in the morning our son has a routine after breakfast to go to the children’s play area opposite the villa, have a quick game of Chess (move the large pieces around), then dip his feet in the main pool and baby pool then we push him in the buggy up to sunset cafe where there is another play area and he can see the chickens and baby chicks. Inside the villa in the lounge we have a big box of toys and books for all ages. He has 2/3 favourite DVDs that have to played every day which include Pingu the Penguin, Fireman Sam, The Wiggles and loads more. Having your own pool is great as we don’t have to worry about the little ones getting splashed by the big kids and you don’t have carry all the toys and inflatables to the main pools. For the bigger kids there are 7 other pools to choose from if they get bored with the villa pool and the main attraction is the 2 water slides which are viewable from our garden so you can watch them from your sunbed. For the afternoon ice cream or shandy fix you only have to walk opposite the villa to the mini market for the chocolate Magnum or Cornetto. In the summer months the Resort usually organise extra children’s activities by the main pool. 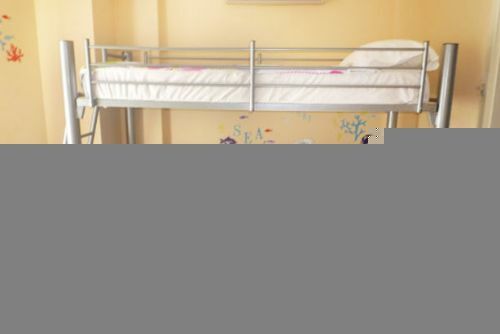 Sleeps 7 + Infants in 1 x double bedroom, 1 x bunk room with pull out double bed, plus sofa bed in the lounge. The Artev beach club is a short 5 minute drive away, a Dolmus mini bus into Bodrum centre stops at the resort. There is a restaurant and a good selection of shops on site, as well as a local village a short walk away. The villa has a private pool and the resort has a shared indoor pool. 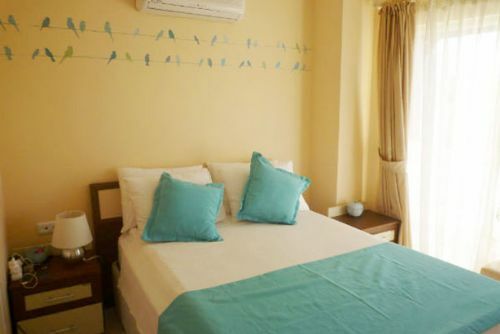 The villa has an excellent list of baby gear including baby monitor, room temperature monitor, blackout blind (children's room only), steriliser, highchair and travel cot. 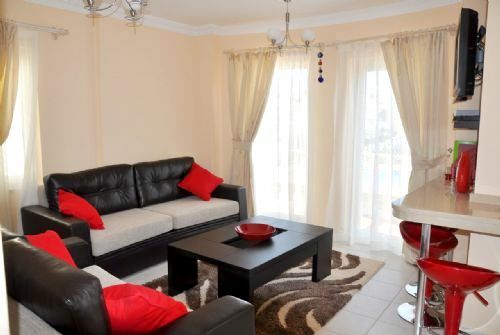 The villa has baby toys, general toys, board games, books, U rated DVDs and playing cards. The on-site restaurant offers a take-away service. Pool inflatables, buckets and spades and a play area on site. Restaurant on site just 5 minutes walk from the villa. 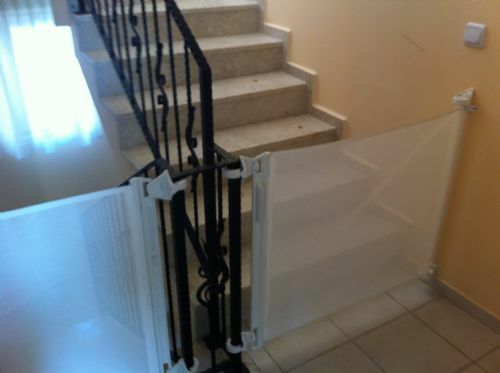 There are 3 stairgates installed in the villa. The villa has private terraces with dining areas and sun loungers. There is a 6-hole course on site and an 18 hole course a short drive away. There are tennis courts onsite. There is a small gym on site. Additional cots and highchairs can be supplied at extra cost, as they are rented via a third party. Really good holiday here with my 4 year old and 8 month old. Ideal if you simply want a safe place to relax while the kids play. 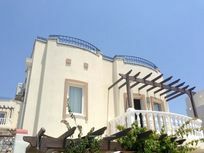 The villa has pretty much anything you might need for the little ones, and is not too far from Bodrum airport (approx 15 mins in taxi) which feels important when you're already dealing with flights and airports with little ones in tow. Well priced, nice pool. We had a great holiday with our 4 year old and 8 month old here. The villa has almost everything you could need for looking after little ones and problems are quickly addressed if you call the emergency contact number. Communication from the owners before the holiday is great. The resort is very hilly, and walking to the beach is out of the question, but I believe it's easy to get transport to the beach once the season starts. We came just before the start of the season as my son dislikes the heat, so the timing was good for us. At the end of April we still got sunny days that were warm enough for going in the pool. Having a pool in front of our villa was fabulous - you could lie on the loungers in the shade with the baby, while the older child played in the pool right in front of you. It feels very safe. The food in the resort restaurant is good and well priced, as is the food at the Sunset Cafe up the road. 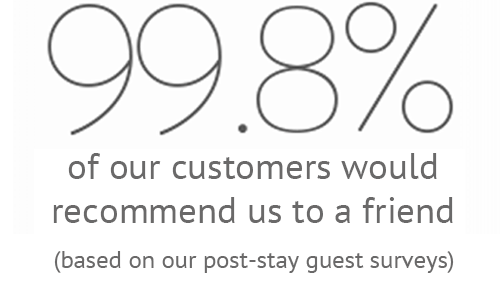 We had excellent service in both places. My son had his 5th birthday while we were away, and the restaurant staff were easily able to arrange a cake and surprise him with it. The Turkish people seem to adore children, especially babies and they got lots of attention. Fantastic villa and in a very good location close to all amenities. We have loved every minute of our stay. The community at Turquoise is exceptionally warm and friendly. Thank you for allowing us to stay. Just wanted to thank you. Your villa is just perfect. Providing everything required for a hassle free holiday. WE had a great chilled-out stay with 2 weeks of sunshine and plenty of bbq's!! and of course one or two drinks!! The resort was quiet and everybody very friendly. Ahmed, the shop owner across from you was very helpful and has a wicked sense of humour ( he must has some Scottish blood in him!!!!!!). We also enjoyed a drink with your neighbour's Kris and Tahen. They provided us useful tips on where to go and things to do. Should we return to Turkey again , which we probably will, we would defiantly be in touch, if you'd have us back!! We've already passed yourdetails onto family and friends. Once again many thanks.